Today was the fulfillment of a long term dream of mine, to run the famous Boston Marathon. As I wrote in prior entries, there was a great concern about the storm that was hitting Boston. It was difficult sleeping last night because of the wind hitting against the windows of the hotel, coupled with the beating of the heavy rain. How can someone run in this weather, especially someone from sunny California? For those with a short attention span the conclusion upfront is that I finished with a time of 3:39:59 (no kidding, my watch stopped at 59 seconds) and that was fast enough to qualify to run Boston again, for all of you that thought I had to run that downhill marathon at St. George in order to get in. I got up at 5 am, and went to breakfast at 5:30 am. That is kind of early with a 10:30 am marathon start, except when you consider the logistics involved with busing over 22,000 runners out over 26 miles to the start. I caught a 6:30 am shuttle from the hotel over to where I was able to get in a long line to board one of the marathon buses. It was not as cold as I had thought, but it was raining. Once we arrived out at Hopkinton, the place of the start, I made my way over to a large tent they had setup in the middle of a large lawn area, but the grass was soaked and the water came quickly into my shoes. We huddled down in the tent, waiting nearly 2 hours before we were ready to leave and take our bags with our “warm-up” clothes over to be checked for pickup at the finish. I was not sure what to wear for the run. Hey, I am from California and didn’t train in anything except shorts and a short sleeved shirt. I finally decided to run in tights, a long sleeved running shirt with my biking Gore-tex jacket over that, and a running hat with a brim. After checking our bags we had more than a half of a mile to the start. I guess I was a bit behind because I didn’t quite get up to the right corral when the race was about the start so I had to crawl through the fencing and run down the sidewalk and enter back through the fence in corral number 13. Gee, I never thought about the fact that I had started from Corral No. 13 and wasn’t it just Friday the 13th? 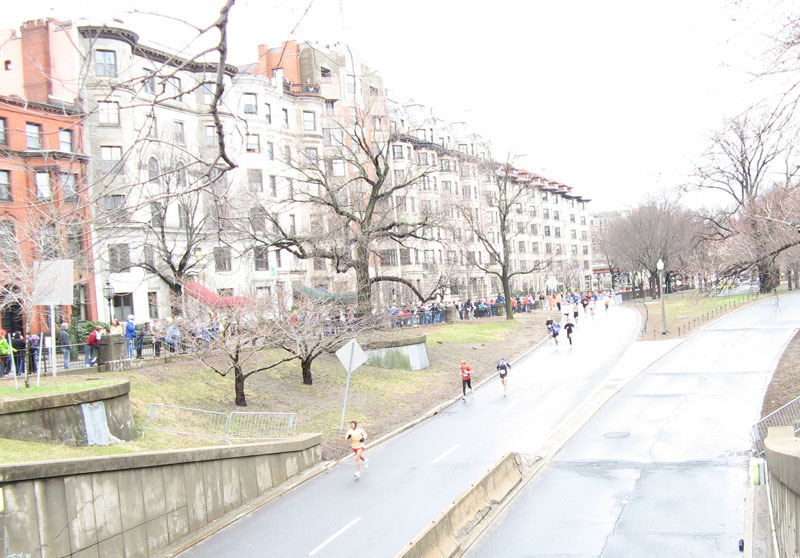 The Boston Marathon is great for many reason. Because everyone needs to meet a tough qualifying time to get accepted, it means that all of the runners there were experienced runners. This also allows them to give everyone their bib number in sequential number according to qualifying time. So if you see people with a bib number in your range, that meant they qualified with a time close to yours. So corral No. 13 was my corral because my bib number was 13,281. They had a total of 23 corrals. The race started and we began to move forward. It was time to shed the poncho and extra throw away long sleeved shirt that I didn’t check but wanted to keep warm with. Unlike other marathons that has one mass start, Boston has divided the field into two waves, with the first wave leaving at 10:00 and my wave leaving at 10:30 am. That meant that it was much closer to the start than in prior marathons and within a couple of minutes I was at the start line and started my watch. The weather was better than I expected because the wind didn’t seem that strong and the rain had stopped. Could it be that I had over dressed and some of those people around me in shorts had picked it right? By mile 2 I had unzipped my jacket and at mile 4 I took it off. But it was only a couple of miles later that it started to rain again and I put the jacket back on, where it remained until the finish. We were greeted with alternating rain, wind and a cooling temperature as we marched mile after mile. I tried to draft behind some big guy when we had the head wind (it was never a tail wind) but hey, I couldn’t find any big guys running. I guess marathon runners are not normally big guys. Many people had told me to just enjoy the marathon. Hey this was Boston and it should be more a celebration with no pressure to qualify to get into Boston as in prior marathons. It is good advice because this was the greatest experience of any of my marathons, despite the lousy weather. Running with good runners was a dream because it meant no winding your way through those runners you often find who start up too far and can’t hold the pace. People were asked to start in a corral that matched their qualifying prior marathon time. There was none of those jacket rabbit runners who took off with no clue of what running 26 miles meant and then would decide to start to walk, just as you were coming up behind then almost crashing into them like a car stopping on a freeway. By mile 12 most all the runners around me were running almost exactly at my pace and I was astounded to hear the wonderful sound of a syncronized sound as it seemed each runner’s feet hit the ground at the same time, like violinists all moving their bow together in perfect timing. Down the road we passed Wellesley college and the spectators crowds there was like having hundreds of cheerleaders rooting you on. The volume was louder than any other place. The fans in Boston were tremendous. We passed through many town and nearly everywhere the streets were lined with cheering fans. So this was a marathon that someone could really enjoy. But I felt good and was running about how I was doing on my last marathon. At the half way mark I realized I could come in under 3:45 and qualify once again to run the Boston Marathon so I had a goal to meet and that kept me driving the pace I had been on. As we approached Boston the winds picked up and it turned cooler. When I was at mile 22 my legs were aching, and begging me to stop. But I had learned a hard lesson before, just ignore those legs because if you stop you can’t get started again. I kept writing my blog in my mind, trying to keep my thoughts off the aching legs. As I was getting near the finish, I realized that not only would I qualify once again for Boston (which required 3:45), I had a shot to break 3:40. That required me to run the last mile in close to a 8 minute pace, but I was very gratified when I stopped my watch at 3:39:59. My official time might be slightly more than that, but I am very happy with how things turned out. What I had feared as absolutely dreadful weather turned out to be runable and my time, although not a PR, was better than I expected. The elite runners were off their times by 7 minutes and over 20 runners had to be taken to the hospital, so I was happy with how things turned out. It is Sunday afternoon and we await tomorrow’s Boston Marathon. The flight from San Francisco was on time, hopefully a good sign. We sat next to a gal who was also running the marathon for the first time so we had a lot to talk about. As we were flying across the United States we could see the weather change from sunny to stormy, then we went past the storm so the weather was fine enough when we arrived, but we could see what was coming. We reached the hotel by taxi at about 11:30 pm, only to find out they had overbooked and there was no room for us. That news was after we could see others in the line before us had to go through some gyrations. It turned out okay because they gave us cab fare and a letter with a free night at a near by hotel, the Hotel at MIT, which turned out to be a very nice room. This morning we slept in, due to the time zone change and around 11 am, made our way back to the Hyatt at Cambridge, where we had our reservation. They had the room ready and gave us coupons for the breakfast buffet. After eating we decided to walk over to the expo, which was about 1.5 miles. I should have know better because by now the storm had hit Boston and it was very windy. The umbrellas we had brought did little to keep us dry, except out heads maybe. It was a long 1.5 miles over and I started to think about running a full marathon into such a headwind because we were walking in the same direction I will be running tomorrow. The expo was packed with people, so many it was hard to move from booth to booth. I guess all 22,000 runners and their families thought this would be a better place to spend the afternoon than outside in the wind and cold. There would be plenty of that for tomorrow. Outside of our window, across the way, I can see a big American Flag. It is fully extended , waving in the strong wind. I received yet another email from the Boston Athletic Association. This one talks about TREATMENT OF HYPOTHERMIA!. As of Friday evening the Boston weather forecast shows 100% chance of rain. Never before was I so excited to spend 26.2 miles on the road, on foot, in the wind (20-25 mph head wind), rain (3-5 inches) and cold (a wind chill index of 25 to 30-degrees F). We went to REI today and to look at buying some waterproof socks, but I just didn’t think I could run a marathon in them. Splish Splash, I am taking a bath! The most up-to-date weather forecast calls for a predicted Spring storm on Monday, including heavy rains (potentially 3 to 5 inches), with the start temperatures in the mid to upper 30’s. Wind will likely be East (in the face of the participants for most of the race) in the 20 to 25 mile per hour range, with gusts to as much as 50 miles per hour. This will produce a wind chill index of 25 to 30-degrees Fahrenheit. Combined with the rain, we are concerned that predicted weather conditions will increase the runners’ risks for a condition called hypothermia. As with any athletic competition, as a runner you are assuming the risks inherent with participation. It is your responsibility to be informed about the risks associated with running in the aforementioned conditions, and the risks of injury or illness will increase with these predicted conditions. While exercising in cold weather, our bodies attempt to maintain core temperature by shunting blood away from the periphery, thus minimizing heat loss. Hypothermia sets in when the body’s temperature drops below normal, starting when the body loses heat faster than heat can be generated. Heat is produced by muscle action and shivering. Very low body temperatures can be life threatening. Mild hypothermia is heralded by goose pimples and shivering as our bodies attempt to raise our metabolic rates to increase our core temperature. Moderate hypothermia will result in muscular fatigue, poor coordination, numbness and disorientation. Severe hypothermia can result ultimately in cardiovascular failure. Treatment of hypothermia requires prompt recognition and treatment as mild hypothermia can progress to a more severe situation if not addressed early. Runners should be removed from cold, wet, or windy conditions. Wet clothing should be removed, and rewarming commenced with warm blankets and ingestion of warm fluids. If the athlete’s condition does not improve, transportation to a medical facility should be arranged. Hypothermia can occur at temperatures at, or below 45 degrees Fahrenheit, or even in higher temperatures when the weather is also wet and windy. Cold temperatures, dampness, and wind increase the risk of hypothermia for runners. Sweat cools the body quickly during cold weather running. Wind evaporates it faster. Be prepared prior to the race. Have extra clothing which will enable you to stay dry even before the race begins. For the race itself, dress in layers of loose, lightweight clothing. The first layer of clothing (closest to the body) should be made of polyester or polypropylene which will “wick” sweat away from the body. Subsequent layers should be loose and breathable-fleece is a good choice. Cotton should be minimized as it can allow sweat buildup. The outer layer should be wind and water resistant, thus protecting from wind, rain, and snow. When in doubt, add the extra layer. You can always remove a layer if you warm up, but you will regret not having it if you start freezing with several miles to go. Protect your head and extremities. Wearing a hat is essential as up to 50% of body heat can be lost though the head. Gloves are important to prevent exposure to the hands. These, too, can be removed if you get warm, but you’ll regret not having them if needed. Mittens are better on colder days as they will keep the hands even warmer. Shield the face with a scarf or high collar. Wear socks that retain heat and wick moisture away. Runners with exercise-induced bronchospasm should attempt to warm air such as through a scarf or mask. A prolonged warm-up prior to hard running can help minimize symptoms. Carry your inhaler if you use one, and use it should it become necessary. Stay with your normal hydration regime, remembering not to over drink. Do not drink alcohol the night before the race. Alcohol will make the body lose heat faster. Run with a partner. It is sometimes difficult to recognize if you are becoming hypothermic. A running partner can help if you get into trouble. Shivering is a sign of hypothermia. The cessation of shivering may indicate more severe hypothermia and the runner should seek evaluation at a shelter. Consider canceling your run or seek shelter if the weather conditions are too severe or you are too tired. Running on ice or over snow-covered terrain can lead to tripping, falling, or injury. Medical stations and American Red Cross locations – located every mile along the route – along the course will have buses to handle your medical needs. Rewarming will be difficult given the weather and normal field size, so if you are not feeling well, do not wait to seek medical attention. Help each other. Be aware of yourself but also make medical team members aware if you see someone on the route who you believe may be starting to suffer from the onset of hypothermia. Keep the runner dry and cover with blankets. Shelter the runner from wind and water. Provide heat to the neck, underarms, and groin. Heat only the trunk initially to avoid core temperature after-drop. After-drop occurs in this manner: Extremities cool faster than the trunk. If you re-warm the extremities, their colder blood will re-enter the circulation and actually worsen hypothermia temporarily. Keep the runner lying down, but only in a warm dry location. Administer warm fluids by mouth if the runner is shivering. If the shivering reflex is lost, a bear hugger should be utilized (loss of the shivering reflex signifies significant hypothermia). Avoid moving/jarring the runner suddenly because this may trigger an abnormal heart rhythm. If CPR is necessary, resuscitation should not be stopped until the person’s body temperature is at least 95°F/35°C (never give up your efforts). All temperatures indicated are rectal measures, which give a closer indication of core temperature. If the victim is cooperative, you may take temperature by other methods. At times I feel a bit like Custard on the eve of his last stand at Little Bighorn. Well, maybe not exactly because Custard didn’t know what was going to hit him. Unlike Custard, I have the national weather service and see the weather conditions for my last stand at Little Big Boston at not going to have the same heat that Custard felt. It is difficult training for a marathon so I have no choice to go ahead and run it. I did my LAST speed workout this morning, a 6 mile tempo run with 4 miles at speed with splits at 7:26, 7:24, 7:44 (hill) and 7:26. Those are right on target per my Runner’s World Smart Coach training plan of 4 miles at 7:26 pace. 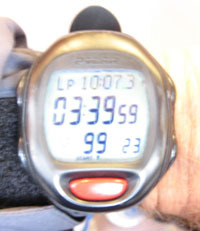 I was amazed how much easier this speed workout was last week where I had to average 15 seconds per mile faster. Those 15 seconds per mile are real tough to get when you are up against your top capacity. Or it might be the tapering down with little running this week (although I have still been biking). Running wise, I feel I am ready for the marathon. When I got up this morning it was 42 degrees. I joked with Ann that maybe I should do the tempo run right then and have her turn the garden hose on me, and plug in the big fan, so I could get a taste of what I will get to experience on Monday. But I decided to wait a bit for it to warm up and do the run under sunny skies. It is beautiful in California right now — so why I am traveling back East? I have been closely watching the weather forecast for Boston. The entire East Coast has a cold spell and with the marathon fast approaching it is not encouraging. As of today it showed worsening conditions from prior forecasts. Then I get this email from the Boston Athletic Association (who puts on the Boston Marathon). Wednesday, April 11 – As the Boston Athletic Association continues to make preparations for Monday’s Boston Marathon, we are monitoring the upcoming weather conditions forecast for this area. Based on the National Weather Service’s most recent report and in cooperation with the Executive Office of Public Safety (Commonwealth of Massachusetts) and the Massachusetts Emergency Management Agency, together with the eight cities and towns along the 26.2-mile marathon route, we are planning for likely heavy rain and windy conditions on race day. However, all race day plans remain the same. The Boston Athletic Association advises participants in Monday’s race to plan accordingly for their run, bringing with them gear and apparel to suit the conditions. The B.A.A. will continue to update its web site as necessary. Another one of those triple days, running in the morning, road biking in the afternoon and mountain biking in the evening. The run was the big effort for me today because it was a speed workout and with the marathon peaking around the corner I am trying to follow the Runner’s World Smart Coach training program rather closely. This program has you input several things, including a recent race time and the number of miles you are running. For this week it called for a tempo run, total of 8 miles with 5 hard miles at a 7:15 pace. I was not quite sure I could keep that pace for 5 miles, but thought I should give it a shot. After a easy one mile warmup I kicked it in and was 7:06 for the first mile, then slowed down a bit, even more when I hit the hill. But the last mile was sub 6:58. 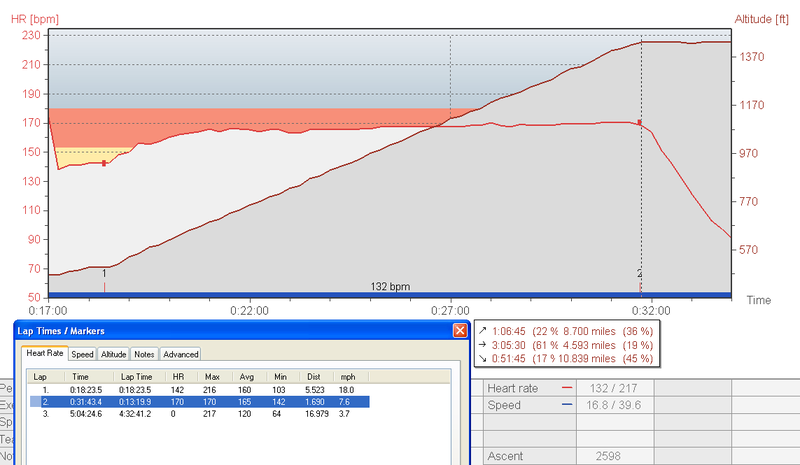 This chart shows my splits, heart rate and altitude for the 8 miles. My pace for the 5 hard miles comes out to 7:13, so I was right on target. My heart rate went as high as 173, while climbing. 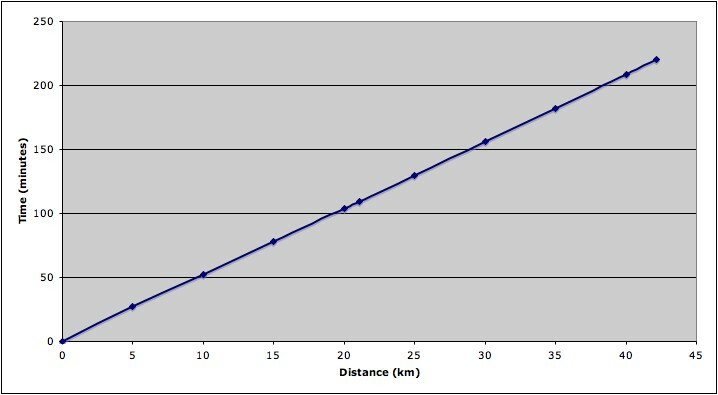 No, the hill is not as steep as it looks on this chart, but there is a definite grade up, which accounts for the faster time on the last mile because that was on the downside part. Click the chart to enlarge. I heard from my son who just returned from a business trip to Boston that it was cold there. The thought had not even crossed my mind to check the weather. All the marathons I have run have been in nice weather and it has been nice here in California. So I got on the internet and see that it is going to snow in Boston and even the 10 day forecast show a high in only the mid 40’s. Guess it is going to be on the cold side so I need to take the right clothes, and prepare for cold and rain, just in case.